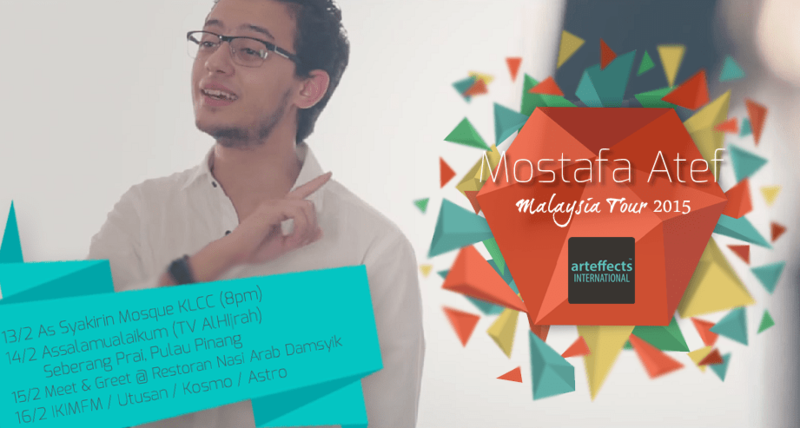 Beginning this Thursday 12th February 2015, Mostafa Atef, a rising star in Arteffects International will start his tour in Malaysia for the first time. Ending on the 16th of February, Mostafa will be promoting his nasheed career, notably his main single, the qasidah Qamarun. The qasidah is one of the songs compiled in Arteffects newest compilation, entitled Soul of Islamic Music. Hailing from Egypt, Mostafa who’s a student of the Faculty of Arabic and Islamic Studies at Al-Azhar University, has a strong, sharp and a resonating voice; Very much reflected in his Quranic recitation and Qasidah. One can note his octal level through his recitation in his Soundcloud profile, a strong proof that his voice can both enchant and impress his listeners, very much evident with this particular track. Mostafa’s mark on the nasheed path is actually through his rendition of the qasidah Qamarun. Delivered in his beautiful voice, Mostafa has brought this particular qasidah to an even livelier version of it, bringing about a greater appreciation of this qasidah. Through his official YouTube channel which attract more than 3 million viewers worldwide, Mostafa also recited his qasidah in a live audience; Even further proving that he is not just a simple person who just sings, but understand and truly feels on what he delivers. That is what sets him apart among most singers. Aside from having a beautiful voice, Mostafa is an exemplar student. He joined a seminar and event hosted with Sheikh Bouti, Dr. Ali Juma, Dr Ahmed Omar Hashem, Dr. Amr Khaled and Habib Ali Jafri, famous for his contributions in a Islamic-Christian dialogue, A Common Word Between Us and You, and also one of panelist in the program titled Ibrahim Abdel Gawad on the Egypt MBC channel. With such a great understanding of on what he recites and sings, it is no wonder that Mostafa Atef can produce a very soulful songs; placing him among the other nasheed and Islamic spiritual singers, making him one of a kind. Songs sung by a learned heart has always been part of Islamic art, and that is epitomise by Mostafa Atef. To all those who don’t want to miss this opportunity to meet Mostafa Atef in-person in his first Malaysia tour, mark these dates on your calendar. For further information regarding his tour, visit Arteffects International official Facebook page. And if you wish to find out more about this amazing reciter, do visit his official Facebook page, Soundcloud, YouTube, Twitter and his Instagram page.